How easy is it to prepare a healthy snack? As easy as this sandwich recipe which takes 5 minutes to make and is healthy and delicious. Grill the pita bread for about 1-2 minutes on each side. Optionally, you can oil the bread before putting it on the grill. Add a layer of fresh, crisp lettuce. Put the ham on top of it, then the tomato slices. Add a little parsley and a sprinkle of paprika. 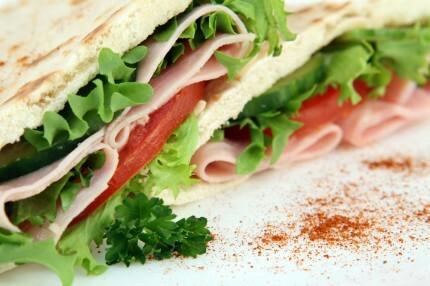 Fold each half pita into a sandwich shape and enjoy your healthy snack.